Join the Bedfordshire Woodwind Academy Flute Ensemble for an exciting and inspirational day directed by Mike Mower – one of the world’s leading flautists and a prolific composer. Mike Mower plays a mean flute (sax and clarinet too) and is a prolific composer. He currently has 87 pieces on the current exam syllabuses of ABRSM and Trinity College. He also writes for professional orchestras, arranges and produces for pop bands, jazz big bands and he even wrote the TV theme tune for Bargain Hunt! 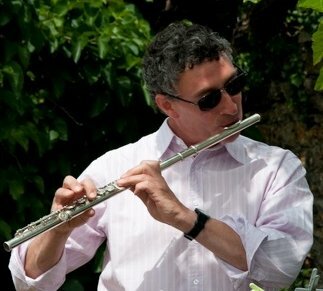 Mike taught himself to improvise jazz and how to compose just by practising different exercises on the flute – come and hear some of his secrets! Mike will bring along lots of his music to demonstrate and will get everyone to play along in different sized ensembles with his music – informative and FUN! The day is being kindly sponsored by All Flutes Plus and they'll also be there on the day with a selection of instruments and music. We look forward to meeting flautists of all ages and abilities, if you're not sure if it is for you please contact Liz via email, or call her directly on 07711 080275 or 01582 883420 and take a minute to Google Mike to find out what a very exciting day this will be. If you can't make this particular date but would like to join us for another similar day then please let us know of your interest as we're always looking for ideas for workshops and events. Please book early for this day to avoid disappointment. Price is just £35 per person, or £30 per person for groups of 5 or more from same teacher (+ teacher comes free!). Refreshments will be provided but please bring your own lunch! What instrument(s) you will bring and what type of flute sessions would you be interested in?